Thrips aren’t housebroken, which makes them messy but fairly easy to detect. If it weren’t for their droppings-and the damage these tiny, shy insects do-you’d hardly know they were around. Adults are almost microscopic in size, with slender bodies that are tan-tobrown-to-black with yellow markings. Many have two sets of wings, which they use for quick getaways when you might be looking. 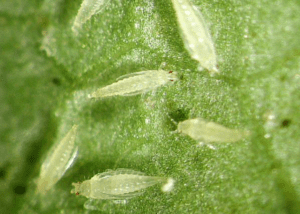 Thrips feed with rasp-like jaws, shredding plant tissues and sucking juices. Injured areas turn white. Look for silver-colored streaks speckled with little dots of black excrement. Thrips attack flowers as well as leaves. On infested plants, foliage may blotch or drop off, and flowers may be streaked or distorted. One quick way to check for thrips is to tap a leaf you think might be infested against a sheet of white paper. If you get specks that move, you’ve dislodged some thrips and had better attend to the relatives they left behind. Females bury their eggs in plant tissue. These hatch within a week into wingless nymphs, which then feed on everything they can get their rasping teeth into. Thrips live two to three weeks. As with most insects, thrips are very active during the summer months, especially July. Check for them often in hot weather and spray plants with water periodically to discourage new populations. If you find thrips, two or three washings with a mild detergent solution (two teaspoons to a gallon of water), followed with lukewarm rinses, usually eliminates them. Space the baths a week apart so you can treat any eggs soon after they hatch. And you’ll want to keep the plant in quarantine until you’re sure it’s pest-free.